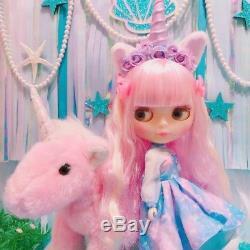 CWC Exclusive 17th Anniversary Neo Blythe Doll Unicorn Maiden. 2018s Anniversary Doll Arriving in August! 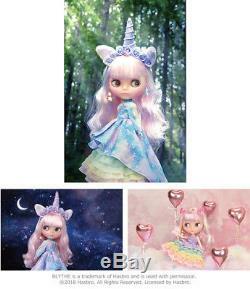 CWC Exclusive 17th Anniversary Neo Blythe Unicorn Maiden Final Specifications! This years anniversary doll is based on the elusive and glorious Unicorn, a magical creature that only opens its heart to pure souls. 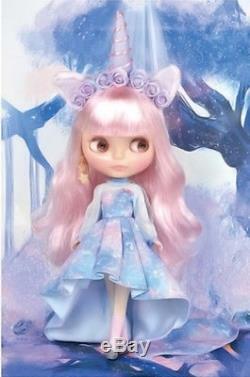 Unicorn Maiden's fashion is pure fantasy, her horn hair accessory and night sky dress is the main focus of her outfit. She lives deep in her forest, and unbeknownst to the world, casts miracles and happiness into the air so that it can land on those deserving of it. Her magical dress that shows her powers can also be arranged into formal, casual, and girly looks! Her overdress has a short front and long fishtail backend, and her pastel tiered skirt can be worn by itself or taken off for a variety of different looks. Wear the entire dress for a formal look, or wear just the tiered skirt and her boots for a change! The tiered skirt can even be worn as a dress itself. Switch it up by wearing just the frilly dress, the fur cape, and hair extensions too! The asymmetrical ear piercings, ribbon belt, mesh tights, strap shoes and middle boots, hair extensions, and other fashion accessories complete the look! Her face type is Radiance Renew, and her face color is a translucent cream. Her hair color is a brand new purplish pink (that comes with a pair of white extensions). Her hair is long, slightly permed, and cut straight across the bangs. Her make up is youthful and lovely. Her eye shadow is pink, with the lower part of the eye hole highlighted pearl white, and a thin purplish pink eyeliner drawn along the edges of the eyes. Her eyelids are a pearl pink, and her eyelashes are a special light brown. The eye chips are all special! Starting with a light blue with embedded holograms, it continues with a light pink, a light blue with stars printed, and a light pink. Her cheeks are pink, and her lips are blurred pink with a lining in the corners of the mouth. Face Type: Radiance Renew Face Color: Cream (Translucent) Makeup: Pearl Pink eye shadow (pink-purple eyeliner around the edges, with white highlights at the bottom of the eyehole), pink lips with the edges blurred, pink cheeks Eye Color: light blue(front, with hologram), light pink (right), light blue (front, with star prints), light purple (left) All special colors Eyelid: Pearl pink Eyelash: Light brown special color Hair Color: Purplish pink Earrings: A pair of silver and yellow star earrings Manicure: Pink Set Includes: Doll, dress, overdress, belt, cape, socks, hat, hair extensions, earrings, tights, pannier (short, long), and dress stand (14 cm). Available August 4th, 2018 (Sat). ITEM IS MINT IN ORGINAL SEALED PACKAGE 100%brand new NEVER BEEN OPENED Around 12 tall. 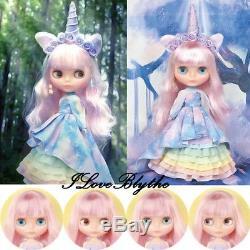 The item "CWC Exclusive 17th Anniversary Neo Blythe Doll Unicorn Maiden" is in sale since Monday, August 13, 2018.